We’d love your help. Let us know what’s wrong with this preview of Blu Heat by David Burnsworth. A man walks into a bar, and dies. It isn’t just any bar, it’s the Pirate’s Cove located on the Isle of Palms, a barrier island just north of the Charleston, South Carolina harbor. Ex-Marine Brack Pelton tries to stop the murder and almost dies himself. The victim, Skip Romeo, has a shady past and some interesting friends. The friend he’d planned on meeting at the bar befor A man walks into a bar, and dies. It isn’t just any bar, it’s the Pirate’s Cove located on the Isle of Palms, a barrier island just north of the Charleston, South Carolina harbor. Ex-Marine Brack Pelton tries to stop the murder and almost dies himself. The victim, Skip Romeo, has a shady past and some interesting friends. The friend he’d planned on meeting at the bar before he got shot was lowcountry Private Investigator Blu Carraway. To ask other readers questions about Blu Heat, please sign up. I enjoyed this action packed novella. I have not read any of the previous novels featuring Brack so I was a bit lost on the references to previous adventures and relationships. Nonetheless, the novella reads pretty well on its own. This is not your cozy mystery. There are quite a few gunshots and killed people in this short novel. The action is nearly continuous. Yet there is some snarky dialog and some interesting characters as well. The setting of the coastal south is interesting too. I recommen I enjoyed this action packed novella. I have not read any of the previous novels featuring Brack so I was a bit lost on the references to previous adventures and relationships. Nonetheless, the novella reads pretty well on its own. I recommend this novella to readers who enjoy a quick shoot 'em up story with tough but likable protagonists. I'll be watching for more from this author. Anyone who enjoys a mystery with fast action, extremely interesting characters, and a very exciting story line read David Burnsworth's books. They do not dissapoint. As someone who hadn't read the author's previous series, I found this introduction to their new one confusing as I didn't know enough about one of the main characters. That said, the mystery was interesting, albeit resulted very quickly in the end. In my opinion, when an author can create well developed characters, nonstop action and suspense in a novella, they are truly gifted. This is the first time reading anything by this author but am anxious to now read more, especially this series. P.I., Blu Carraway, as the synopsis states, is meeting an old friend, however, he walks into what was a shootout with the bar's owner, Brack Pelton and 2 unknown assailants, leaving one of them dead along with Blu's friend. Carraway, not happy about it, end In my opinion, when an author can create well developed characters, nonstop action and suspense in a novella, they are truly gifted. P.I., Blu Carraway, as the synopsis states, is meeting an old friend, however, he walks into what was a shootout with the bar's owner, Brack Pelton and 2 unknown assailants, leaving one of them dead along with Blu's friend. Carraway, not happy about it, ends up working with Pelton to find out what and who are behind the shooting. What they don't know is how many more will die. What a fast read! I've read both of David Burnsworth's novels and thoroughly enjoy Brack Pelton and his cronies, but Blu Carraway just might edge him out as my favorite Burnsworth character. I refuse to give any spoilers, but I will say you won't be disappointed with this novella. It is fast paced and full of tension. Thankfully Burnsworth delivers on that tension with an ending that is unexpected, but definitely makes you want to read whatever happens next. 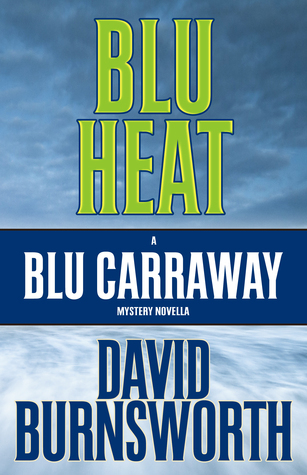 In Blu Heat, the introductory novella into the new Blu Carraway Mystery Series, author David Burnsworth transports the reader to the sultry lowcountry setting of Isle of Palm, SC for an intriguing Blu Carraway Southern noir / mystery adventure. When Skip Romeo is killed while waiting to meet up with lowcountry PI Blu Carraway in Brack Pelton's Pirate's Cove bar on the Isle of Palm, all hell breaks out! Both Brack and Blu are determined to find the killer, so they team up and engage in a dangerou In Blu Heat, the introductory novella into the new Blu Carraway Mystery Series, author David Burnsworth transports the reader to the sultry lowcountry setting of Isle of Palm, SC for an intriguing Blu Carraway Southern noir / mystery adventure. When Skip Romeo is killed while waiting to meet up with lowcountry PI Blu Carraway in Brack Pelton's Pirate's Cove bar on the Isle of Palm, all hell breaks out! Both Brack and Blu are determined to find the killer, so they team up and engage in a dangerous game of cat and mouse seeking revenge and justice throughout Charleston. Author David Burnsworth weaves a fast-paced and suspenseful tale that follows Blu and Brack's investigative journey as it takes them all over Charleston in search of the killer. The reader is easily drawn into this well written story with its richly descriptive plot and setting, it is filled with enough action and unsuspecting twists and turns that takes the reader on one hell of a thrilling roller coaster ride. As a fan of Southern fiction, I loved the richly descriptive Charleston setting and the surrounding lowcountry SC areas. I was intrigued by the author's creativity of intertwining his previous Brack Pelton Mystery Series featuring Brack Pelton with the new Blu Carraway Mystery Series featuring low country PI Blu Carraway. The author masterly weaves one hell of a new explosive mystery, where Blu and Brack team up and embark on a dangerous adventure to find the killer and seek justice! With an intriguing cast of characters; witty dialogue and dramatic interactions; and a richly descriptive setting that makes a person want to visit the picturesque city of Charleston, its historic landmarks, and the surrounding lowcountry areas; Blu Heat is an awesome debut mystery series novella that has the true essence of a classic Southern noir mystery! Disclaimer: I received a copy of the book from the author / publisher in exchange for my honest review and participation in a virtual book tour event hosted by Partners In Crime Virtual Book Tours. David Burnsworth became fascinated with the Deep South at a young age. After a degree in Mechanical Engineering from the University of Tennessee and fifteen years in the corporate world, he made the decision to write a novel. Burnsworth is the author of the Brack Pelton Mystery Series and the Blu Carraway Mystery Series. Having lived in Charleston on Sullivan’s Island for five years, the setting w David Burnsworth became fascinated with the Deep South at a young age. After a degree in Mechanical Engineering from the University of Tennessee and fifteen years in the corporate world, he made the decision to write a novel. Burnsworth is the author of the Brack Pelton Mystery Series and the Blu Carraway Mystery Series. Having lived in Charleston on Sullivan’s Island for five years, the setting was a foregone conclusion. He and his wife along call South Carolina home.